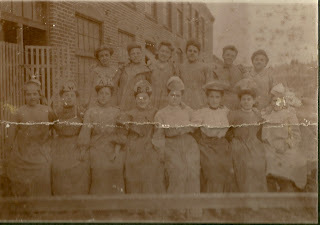 Wonderful old photograph of women workers at, according to text on the reverse, a Livermore Falls Box Shop. The text reads: Liv. Falls Box Shop". I'd scan it but it's in rather light text against a medium gray mat. Livermore Falls, Maine, is in Androscoggin County, along the Androscoggin River. Some of the women are wearing hats with initials on them, hopefully their own initials for genealogy purposes, not initials denoting some aspect of their employment. I see someone with a partially obscured first initial and last initial of W; another with the initials AL; another with EP. When researching online, I came across a disheartening reference in the Annual Report of the State Board of Health of Maine, for the year ending 1885, to a condition called pulmonary phthisis reported by Dr. A. R. Millett of Livermore Falls. He cited a case in which a healthy young man went to work in a box shop, apparently inhaled the dust there and was dead three years later. I hope the women in the photograph fared better. We owe a debt of gratitude to our ancestors for the hardships, known and unknown, they endured to support and advance their families. 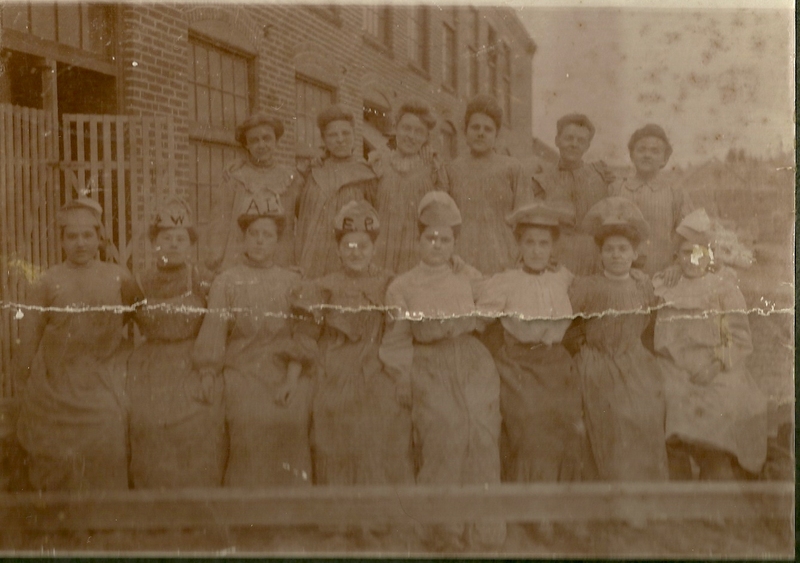 If you have any insights into the identities of any of these workers, I would love to hear from you. Thanks for stopping by!